We are all guilty of tasting a little bit too much wine sometimes: amateurs or professionals. Sometimes it is just hard to remain sober. Not to mention the second day hangover. This post is related to this one as I am about to tell you what happened to the lamb chops I left to marinate for almost 4 days. I followed Florin‘s advice and left the lamb chops fully immersed in chopped onions so that most of the blood went into the onions leaving the lamb chops tender and ready for cooking. 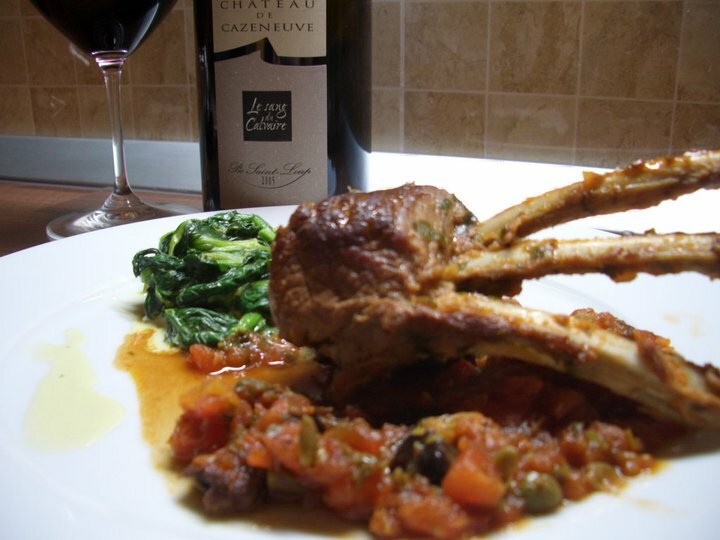 Florin also recommended me to make a sauce Provencal next to this lamb chops and it was indeed a very good idea. Here is what I did. I started by preparing all the ingredients. 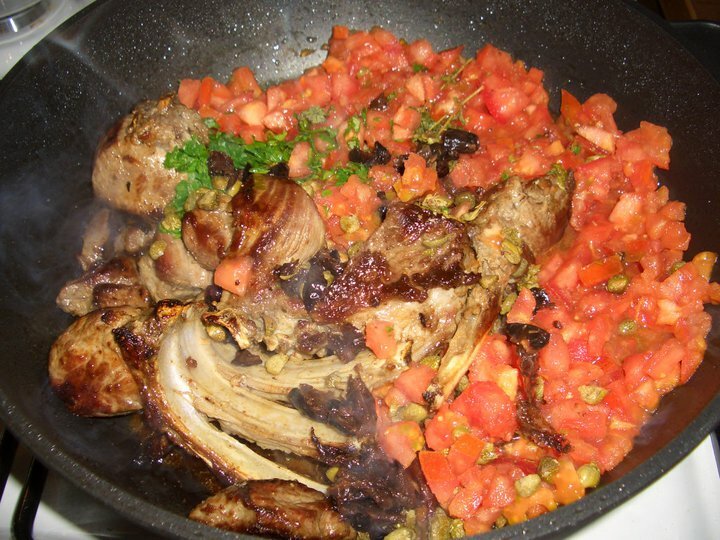 When the lamb chops are on the frying pan the whole process takes about 15-18 minutes at most. For the Provencal sauce I cut the onions in small pieces, the parsley and prepared a little bit of thyme to go in as well. 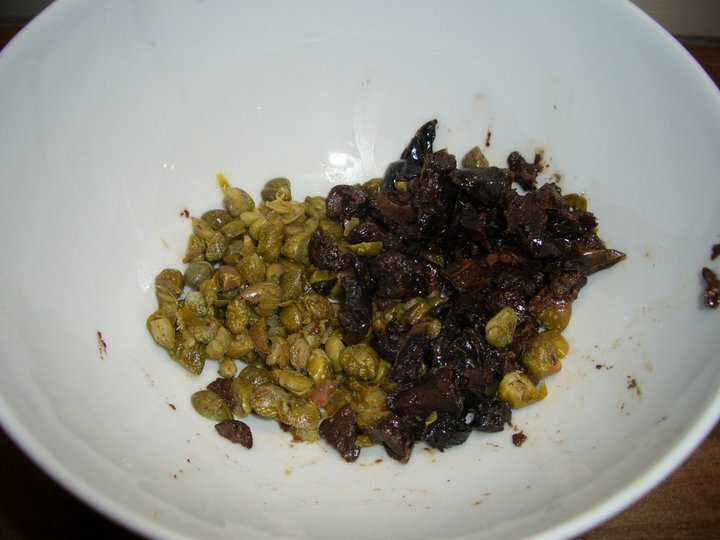 I also cut black olives and capers in small pieces. The bad part is that you really have to clean the lamb chops from pretty much all the fat they have and trust me: they have fat in all hidden places. But once that is gone, things are going into the right direction very quickly. The lamb chops were cooked for about 5 minutes on a high fire, then lowered the fire and left it covered for another 5 minutes. I prefer my lamb chops cooked medium rare so if you don’t like any blood in yours you should leave it more. 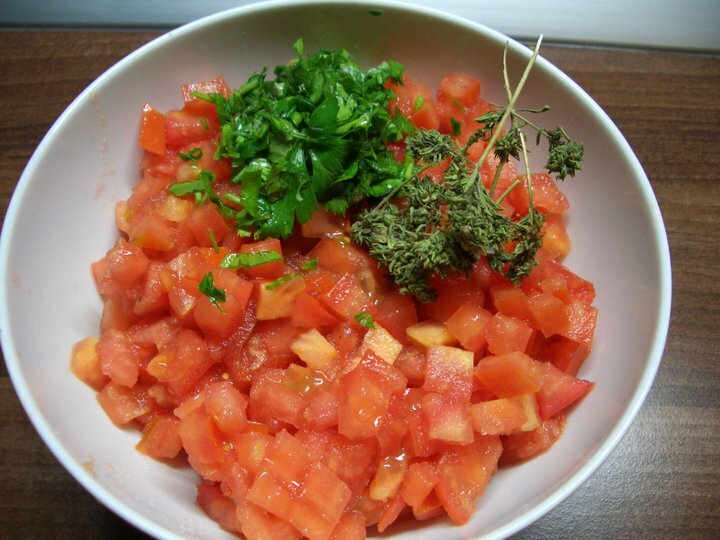 I added on the same pan the other ingredients: tomatoes, capers, black olives, parsley, thyme, salt and freshly crushed pepper. Unfortunately I did not have fresh basil to add but that didn’t spoil the final result. I left it covered for another 5-6 minutes so that the small onions remain firm but get to blend in all the other flavors. I prepared some fresh spinach, as a side dish, in a little bit of butter, added salt and freshly crushed pepper, left it for 2-3 minutes to soften, then added a little bit of sour cream and left it another 3-4 minutes so the water can evaporate. 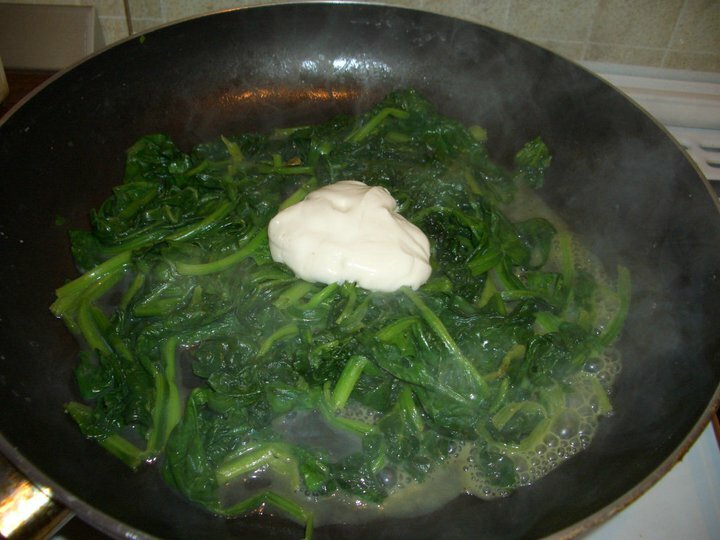 Cooking spinach like this will retain most of its vitamins. The whole cooking process took me about 35 minutes including cutting the ingredients and cleaning the fatty from the lamb chops. 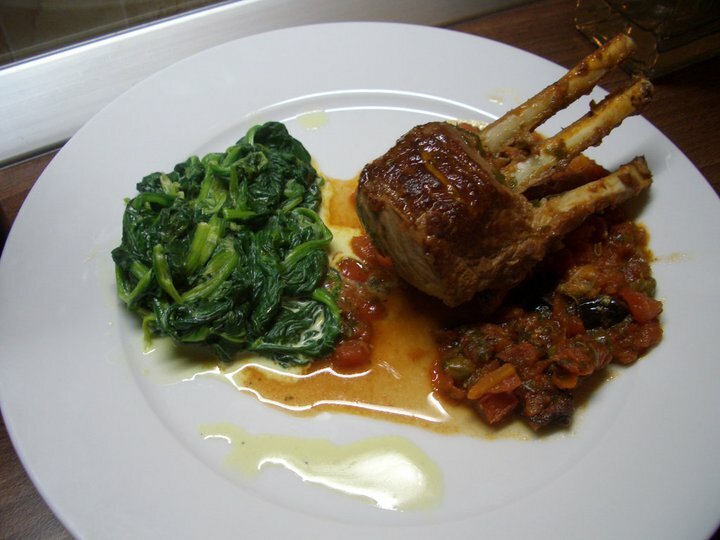 The final result was a really tasty dish with medium rare tender and juicy lamb chops, sauce Provencal and fresh spinach. The dish was paired with a wine I recently received as a gift. Blend of 95% Mourvedre and 5% Syrah aged for 24 months in French oak. I am a big fan of this producer and this region from the Languedoc. With the new classification system, Pic Saint Loup becomes a Grand Cru du Languedoc. The wine has a dark red garnet color. The nose shows strong aromas of black olive and mint, accompanied by cocoa, mocha, black pepper and a discreet mix of sweet red and small black fruits. In the mouth the wine surprises on the initial attack by how balanced it is, with firm tannins, a nice mid palate feel with a mix of discreet ripe red fruits, strong aromas of black pepper, cocoa and dark chocolate. The wine has a medium plus aftertaste leaving a bitter sweet finish with sweet fruit and black olive. A very approachable Mourvedre already and an Excellent wine. I have to confess liking this wine more on its own than paired with food and this is a rare event. Usually the opposite happens. When served on its own the wine shows tremendous balance and surprises by how light it feels in the mouth. Please do not mistake the word light by thin in this case. I mean light as in how drinkable the wine is. Paired with food, the wine gains in depths and in body becoming heavier on the palate and showing more fruit then spices. I blame it on the heavy spiced Provencal sauce. I paid a visit on SAT morning to Piata Matache – some type of vegetables and meat farmers market in Bucharest – where I usually find good lamb, beef and goat meat and was able to find what I was looking for: a nice tender pack of fresh lamb chops. I kindly asked Florin how does he usually prepare the lamb chops and after receiving proper instructions, a little bit depressing for me initially, I ventured to try it anyway. 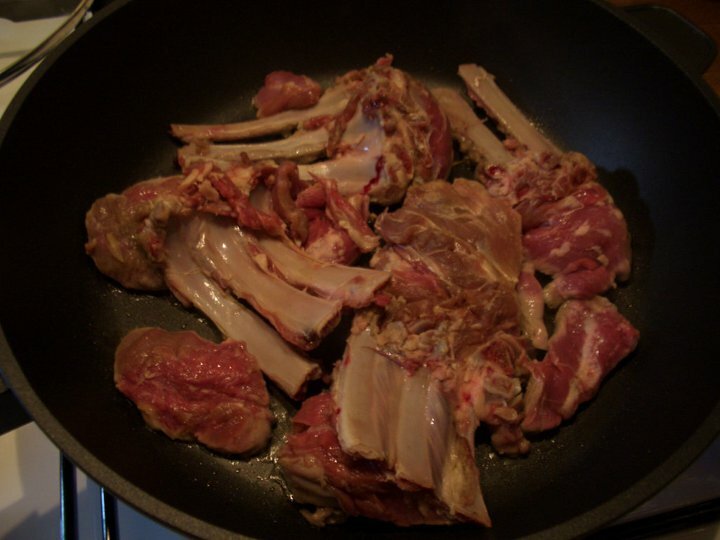 I found out that usually Romanian lamb chops need to spend more time marinated, about 3-4 days before they get really tender as opposed to New Zealand or Scottish lamb chops that are very tender and can be prepared almost immediately. In spite of that, SAT I grilled a few of them anyway and the rest I put to marinate and will wait for 2-3 days before cooking them. The grilled lamb chops were pretty tender already, so now I am really curious how the marinated ones will be. 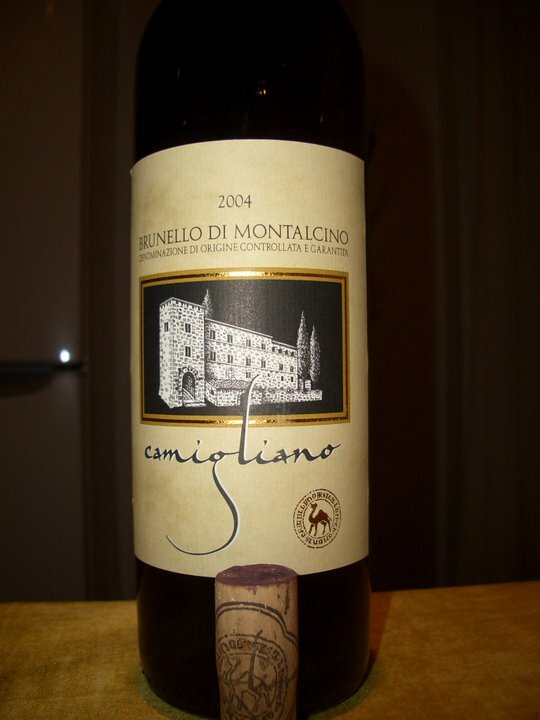 I was in the mood for an Italian wine so I chose a 2004 Brunello di Montalcino that was purchased from a wine shop in Italy. The wine has a red garnet color. Upon opening the wine shows ripe red fruits, yeast and earth. 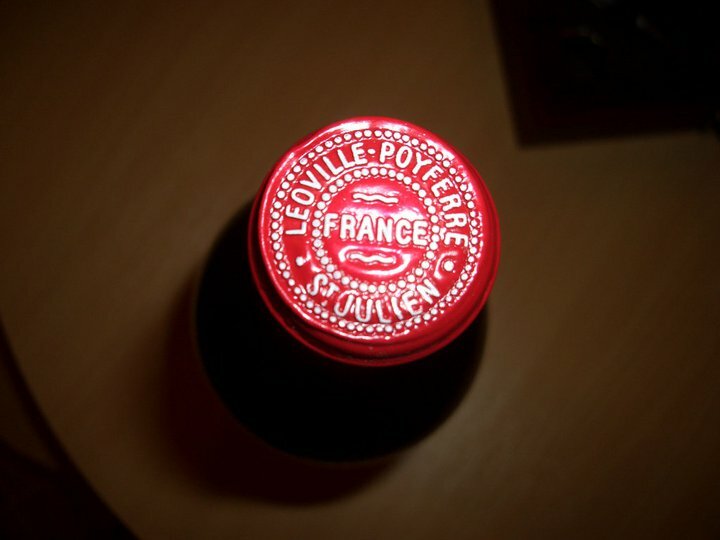 After about 2 hours in the decanter the wine opens up more and reveals leather, earth, a mix of sweet ripe red fruits: strawberries and cherries developing towards very discreet small dark berries. In the mouth the wine is medium body with firm tannins, with a salty component that can be felt on the initial attack, developing flavors of sweet red fruits, dry mushrooms, earth and coffee bean. The salty component is very interesting and intriguing. The finish is pretty dry and leaves bittersweet dark chocolate on the medium aftertaste. A Very good- wine. 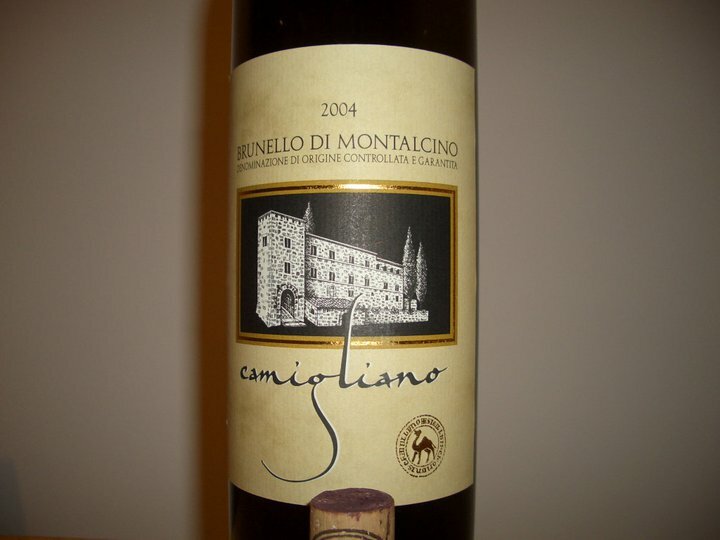 I was expecting more from a Brunello, especially from the acclaimed 2004 vintage. Paired with the grilled lamb chops it was all right. This is not a wine I would purchase again and I firmly believe that, for the same money, you can find better examples of 2004 Brunello di Montalcino. After visiting Recas Winery at the beginning of the month, Mr Cox, one of the shareholders and our host, was kind enough to provide me with a barrel sample of Cuvee Uberland 2009 to taste at home. During the visit at the winery we tasted about 35-38 different wines and did not really have the chance to give each wine the time it deserves. Starting with 2007 the grapes that make Cuvee Uberland are cut and left for a certain number of days to dry in the vineyards. 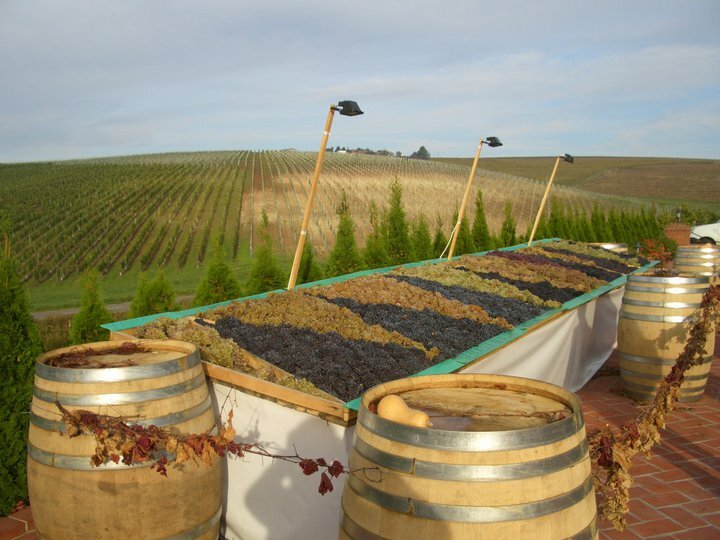 In 2007 they were left to dry for almost 21 days and for 2009 for 14 days. 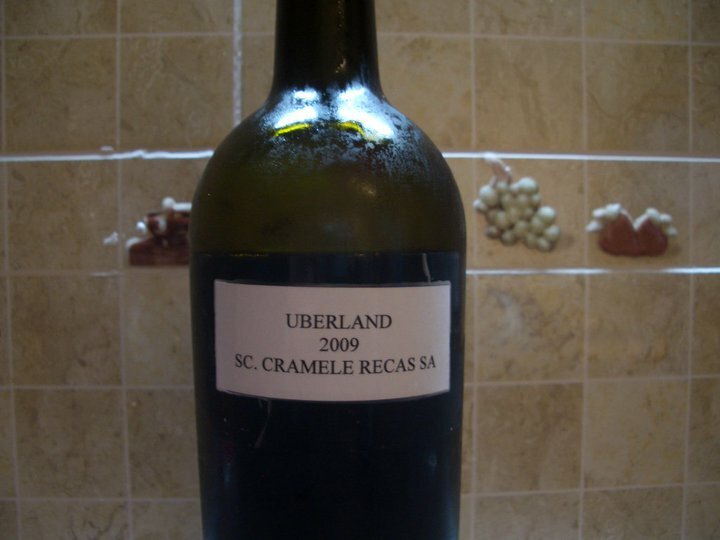 Cuvee Uberland is a blend of predominantly Merlot with Cabernet Sauvignon and Feteasca Neagra. 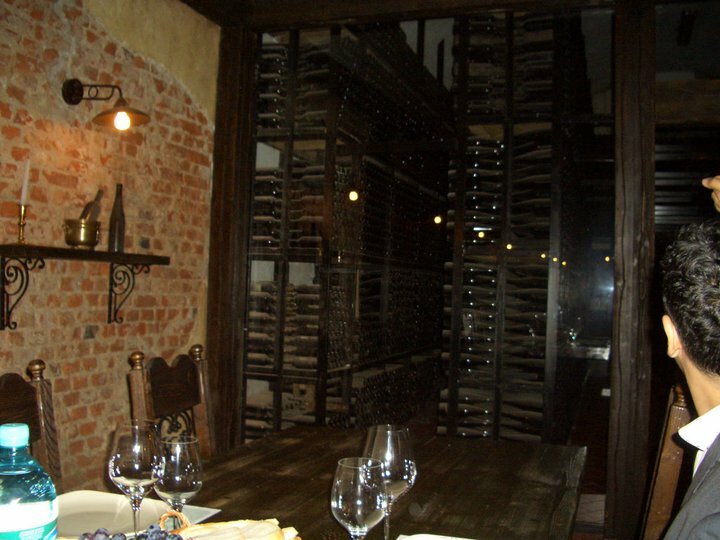 The wine is usually aged for 12-14 months in Transylvanian or Slovenian oak. As Mr Cox confessed during our visit, they are still experimenting with this new method of drying the grapes looking to achieve a perfect balance in the wine.The 2009 is still in barrel and most likely will be bottled in November. Recas Winery is expected to launch their Cuvee Uberland 2008 in November during the Goodwine fair. The wine has a deep dark red-purple color. The nose is sweet, dominated by toasty and vanilla flavors from the oak where it still rests, but underneath there are very strong aromas of ripe almost over ripe dark fruits: blackberries, dark cherries, prunes, mulberries and caramel. The wine is richly textured in the mouth, with an immediate off dry sensation, with round, ripe and smooth sweet tannins, with rich layers of sweet dark fruits and vanilla, offering an ample creamy mouth feel- a truly hedonistic wine. 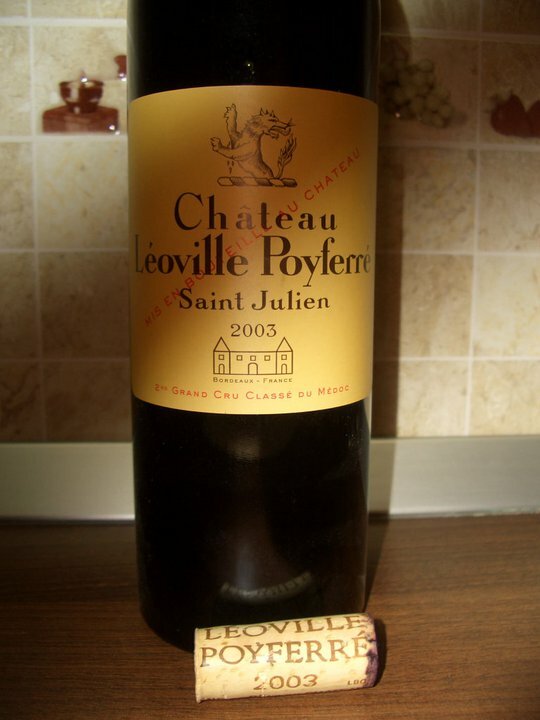 It covers the mid palate nicely and leaves a sweet fruity medium plus aftertaste. The wine promises a lot but there are some disturbing things as well that hopefully will be balanced with bottle aging: the alcohol presence and the jammy, over ripe fruit flavors on the nose. I can already predict that this wine will be a major success on the Romanian market. That immediate off dry sensation you have in the mouth and the sweet fruity finish are perfect for the Romanian consumers. The wine is very New World style, flirting with the idea of being a fruit bomb now. There is no point in rating this wine at this stage as I am sure with aging in bottle the wine will get better balance. For my palate this wine is a little bit too much, too over the top now. I admire a lot the work and the experimenting they do at Recas Winery and I would like to re-taste this Cuvee after 6 months of bottle aging. Last SAT I got together with some good friends at the cozy Escargot bistro. What started as a calm reunion ended up as a pretty entertaining party with plenty of good wines and tasty food. 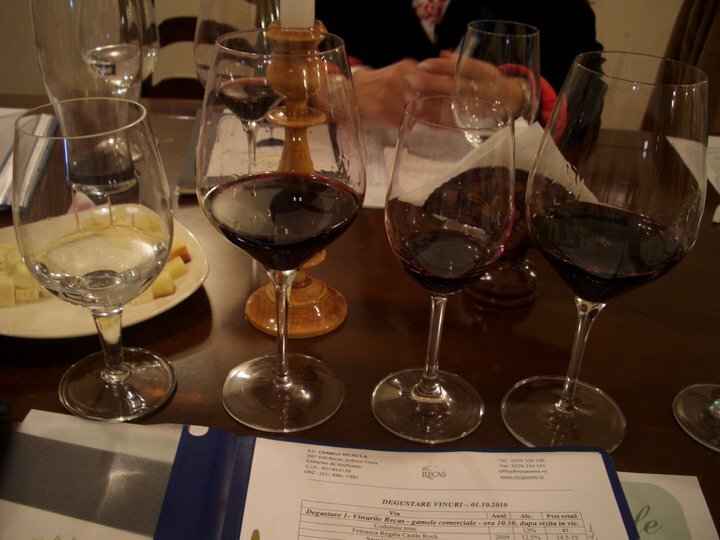 The wines were served in a descending order by vintage. Here are the tasting notes. This wine has a very good QPR. For about 7-9 EUR per bottle, the wine is amazingly good. The wine has a pale yellow lemon color. The nose is very fresh with plenty of floral aromas, lemon zest and green apples. In the mouth the wine is off dry with a very nice balance, nice freshness, good acidity, has a medium body and good concentration with pleasant aromas of citric fruits, green apples, white and yellow flowers. A medium aftertaste makes this wine a killer for the price it sells for. Very good+ and everybody loved it. 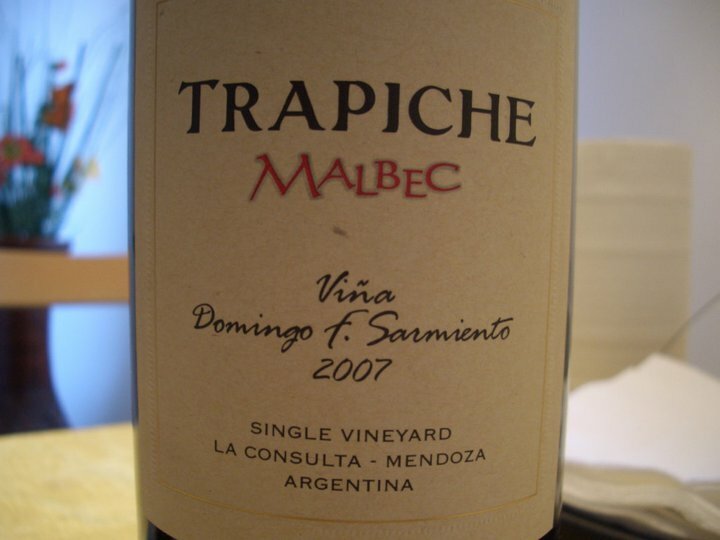 Coming from the Single Vineyard collection chosen by Trapiche each year from their top 3 producers, this young 100% Malbec spent 18 months in new French oak. 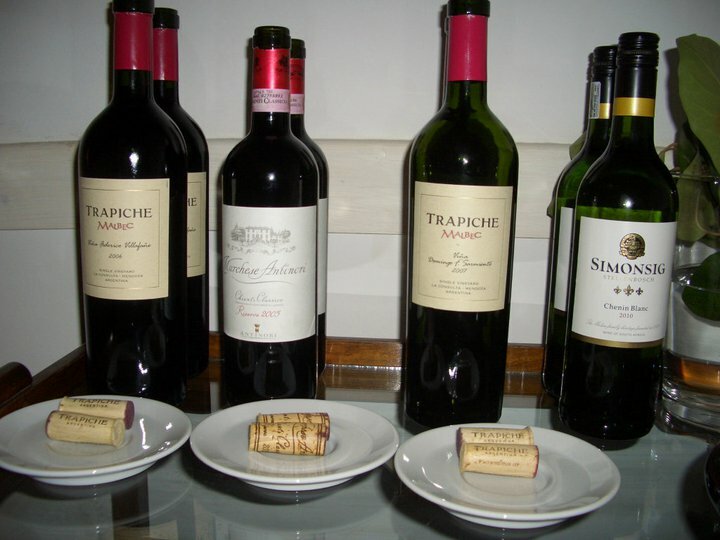 I did write tasting notes about the other 2 bottles of the 2007 vintage here: 2007 Trapiche Malbec Single Vineyard Vina Fausto Orellana de Escobar and 2007 Trapiche Single Vineyard Vina Adolfo Ahumada. The Domingo Sarmiento has a dark purple color. The nose shows aromas of sweet caramel, mocha, a lactic note from the oak, cream and cinnamon. In the mouth the wine is full body with lavish aromas of red and small dark fruits, mocha, sweet tannins and a round mouth-feel. The wine has a pleasant finish with a fruity long aftertaste. Very good+ wine on its way to become Excellent with more aging in the bottle. The wine comes from yields of about 7000-8000 kilos per ha. 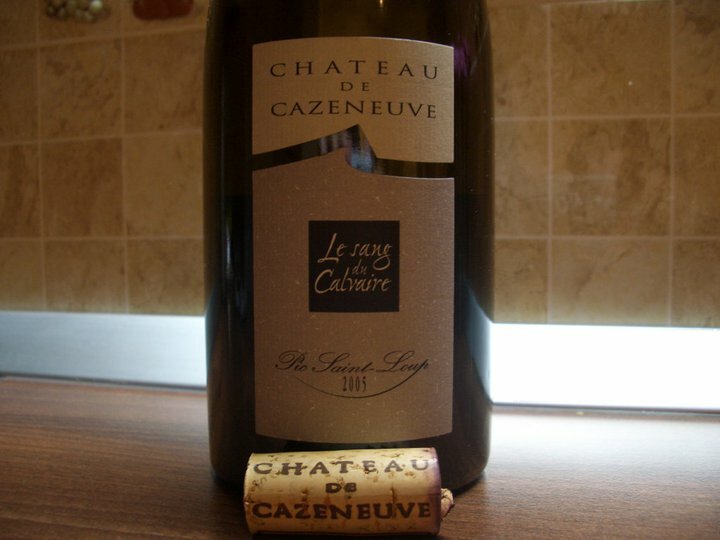 This is one of my favorite wines for under 25 EUR with an amazing QPR. The wine has a dark red/purple opaque color. The nose is complex with dark ripe sour cherry, cassis, hints of oak, earth, dark chocolate and spices, very nicely balanced. Everything is dark about the nose and very intriguing. In the mouth the wine is full body with lots of dark fruits, black currant, dark chocolate, very Bordeaux style, black pepper and finishes in a medium plus aftertaste with a pleasant bitterness from dark chocolate and tea leaves. Always an Excellent wine. This was the Wine of the night for me. A blend of 75% Syrah, 15% Grenache and 10% Mourvedre aged for 18 months in French barrels coming from Languedoc. 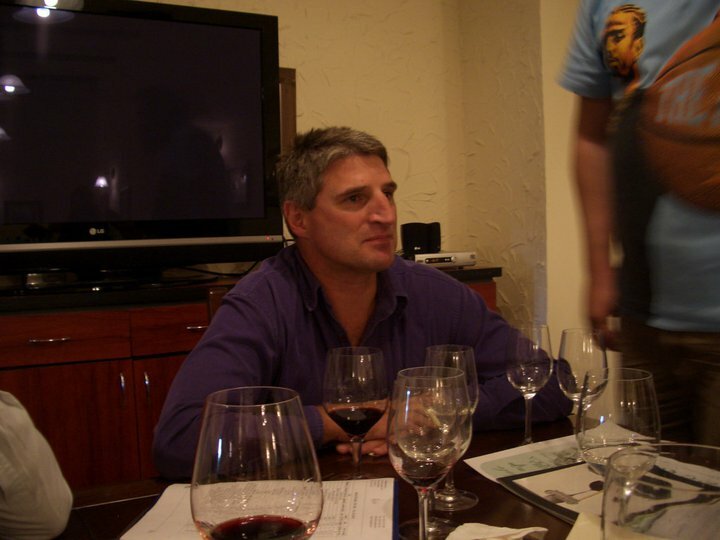 Gerard Bru, the owner of Chateau Puech Haut, works with Michell Rolland and Philippe Cambie as consultants. 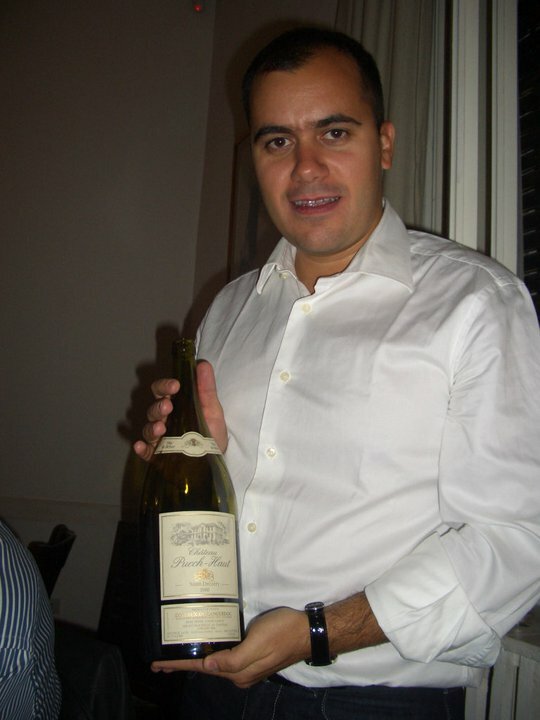 Chateau Puech Haut provided the wines in Magnums for the 2008 Cannes festival. In the past I tasted the 2004 Chateau Puech Haut Tete de Belier rouge. The 2005 Tete de Belier has an opaque dark red color. 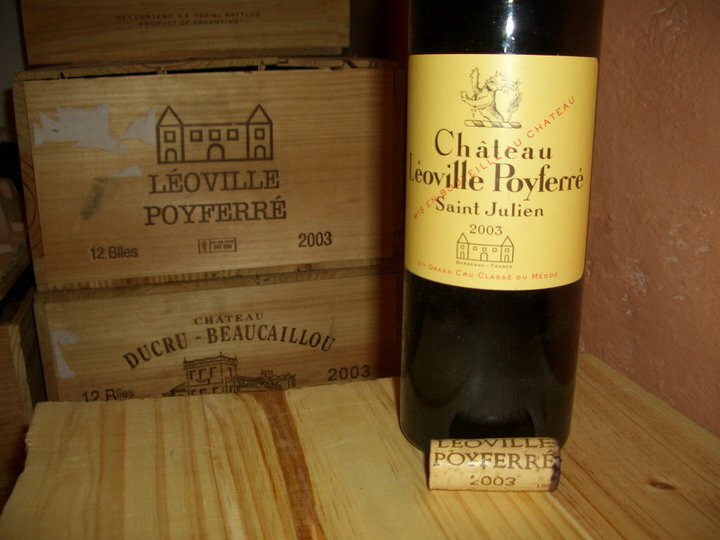 The wine has a very complex nose, a mix of small ripe red and dark berries with earthy, toasty and spicy flavors. In the mouth the wine is very concentrated, full body, with plenty of glycerin, spicy, ripe pure red fruits with tobacco and earthy tones, polished and firm tannins, but everything in a perfect balance. The finish is long and spicy on this big wine. Exceptional bottle of wine. The 2005 Tete de Belier is a better, more focused and concentrated wine than the 2004. 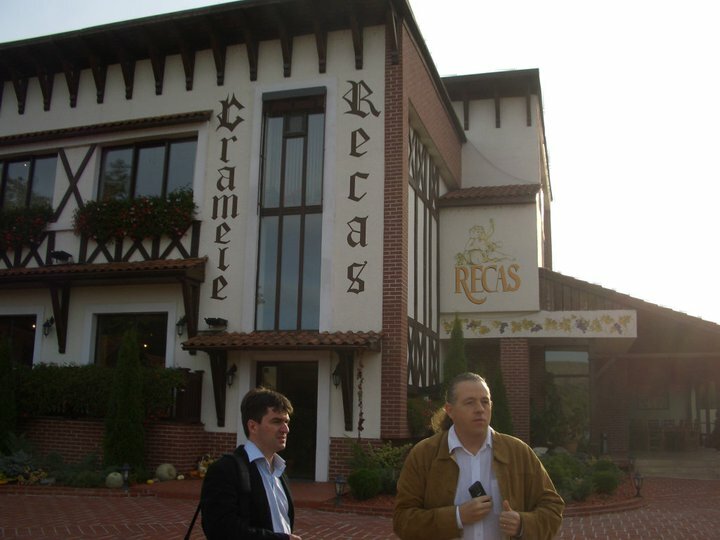 On October 1st, 2010 I got the chance to go to Timisoara and visit Cramele Recas. I have to confess that I long wished to visit them but did not have the time and willingness to drive 550 km and spend 7-8 hours on pretty busy and bad Romanian roads to get there. But out of the blue they made me an offer I couldn’t refuse: an invitation to go by plane in the morning to Timisoara and return back in the afternoon. How could I say no ? It is quite impressive what they managed to do over there. They bought the company from the Romanian authorities in 2000 and invested over EUR 20 Millions so far. Currently they have 600 ha of newly planted vines with an additional 200 ha being planted by 2012. 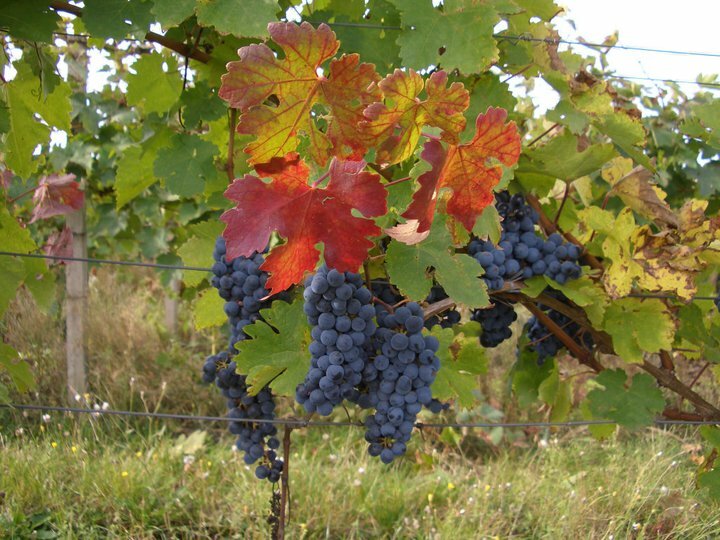 The oldest vines are since the 1950s. They were in the full process of harvesting the 2010 crop so you could easily see new John Deer trucks almost everywhere in the vineyards carrying the grapes back to their premises. 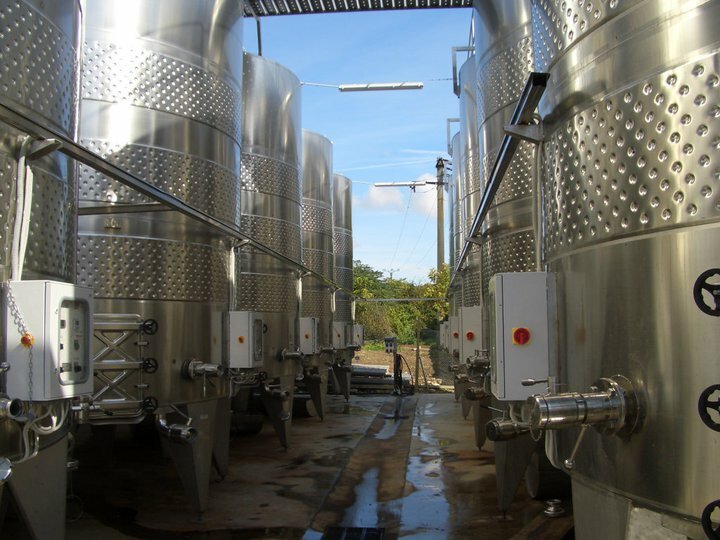 All equipment is brand new in the vat rooms, new stainless steel destemmers, electronically controlled temperature panels everywhere for the large fermentation tanks, a winery capable of safely fermenting and storing about 5 Million liters of wine. Probably this state of the art premise is the norm abroad, but for Romania it’s a rare picture. Our host was one of the shareholders of the Company, Mr Philip Cox, in charge with pretty much everything there: supervising the work in the vineyard during the year, working close to the winemaker, tailor making certain wines so they can be closer to the taste of some of their export markets. Later during the visit he was joined by his wife, the export manager. After a visit in the vineyard where plenty of people were picking up the grapes we went back to the HQ and had a tasting of some of their entry level wines. We tasted about 8-10 wines. Nothing memorable but interesting to see that they are careful with the quality on every level. 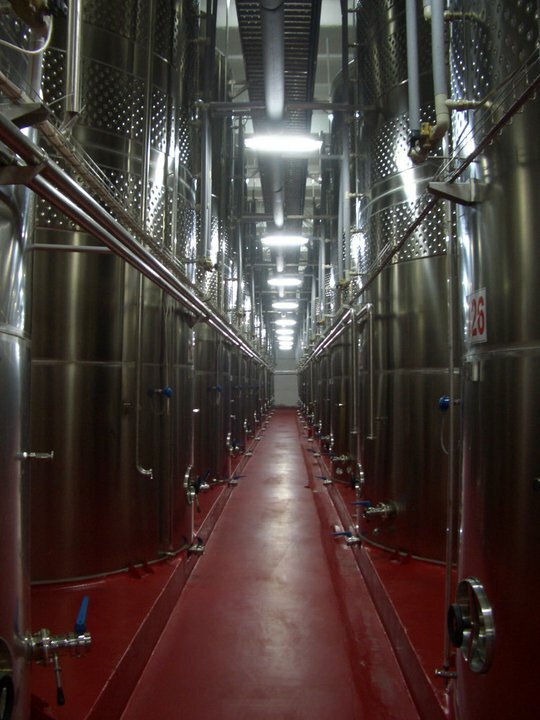 We went into the fermentation room where plenty of massive stainless steel tanks were under heavy duty carrying the ongoing fermentation of the new 2010 crop. We also met their Australian winemaker, Mr Hartley Smithers, who usually spends 4 months in Romania during autumn coordinating the whole process of harvesting, fermenting and making the blends. When he is not in Romania, Mr Cox supervises the necessary work in the vineyards based on the his advices. 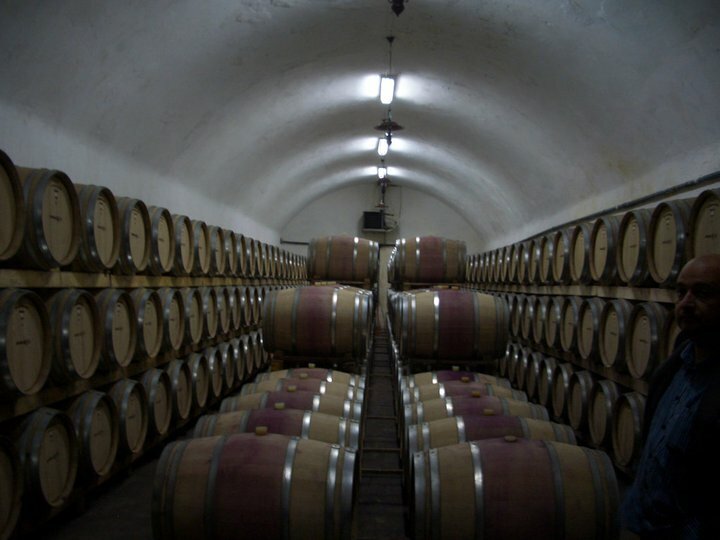 Some of the wines are aged in oak barrels for as long as 12-14 months. They started to use more French and American oak as, based on Mr Cox’s statement, the Romanian oak is not consistent in quality. The afternoon was the most hectic part of this trip. 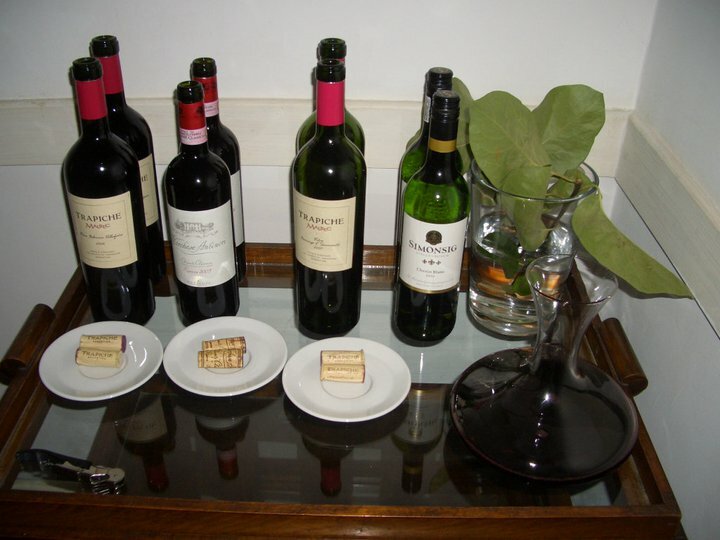 We had to taste an additional 25-27 wines: their middle and premium level wines and some of the imports. The most interesting part of tasting their premium wines, was a vertical of 4 vintages of Cuvee Uberland(2006-2009) with 2009 still in barrel. 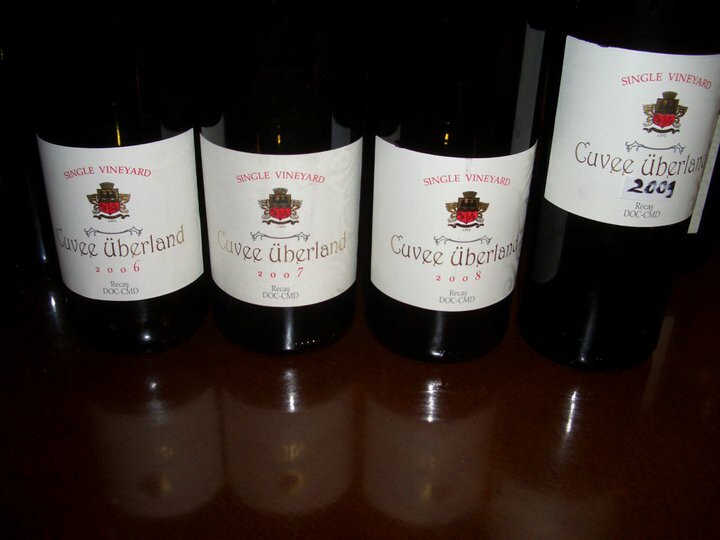 The 2009 Cuvee Uberland will be bottled in November and kept in bottles another 6 months before being released. They started with the 2007 vintage to change completely the style of the wine, by cutting the grapes and leaving them to naturally dry in the vines for 3 weeks in 2007 and 14 days in 2009. They are still experimenting with this new method but so far I believe that the 2009 is their most successful wine. 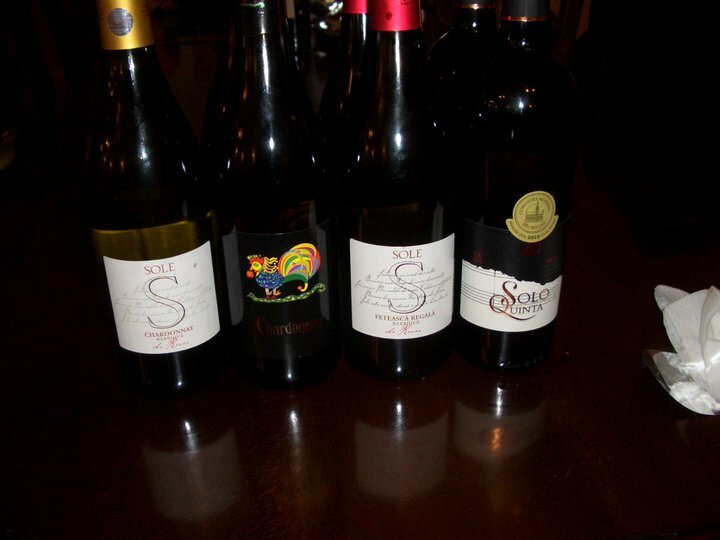 2009, just like the rest of Europe, was a great vintage in Romania. 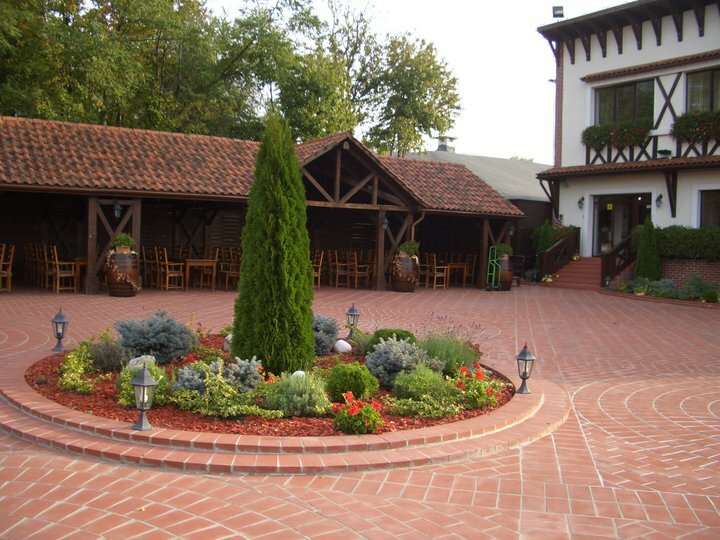 It seems that 2009 is in line with the 2003 vintage in Romania capable of giving some of the best wines made. As much as I do not prefer the 2007 or the 2008, I am a big fan of their 2006, which gained more in the aftertaste, and find the 2009 having a great potential to surpass it. A new tasting of these two last wines will bring more clarification to the table. Another interesting wine is the white Solo Quinta 2009, a blend of 3-4 different white grapes with a small part of Merlot made as a white wine. The Solo Quinta has a very interesting story – a brilliant marketing initiative if you ask me. The first Solo Quinta was made in 2008 using the same recipe of 3-4 white grapes and a small Cabernet Sauvignon part made as a white wine. It seems they received an order from a customer in 2008 to make a white wine from Cabernet Sauvignon so part of this ended up making the new Solo Quinta. The wines had a very positive feedback from the customers. Mr Cox mentioned they have an ambitious project to launch a new icon wine made from Feteasca Neagra with a double fermentation(appasimento technique) in a joint venture with the largest producer of Amarone from Veneto. Special works in the vineyards and new facilities with automatized temperature to dry the grapes are under way and signing a contract is pending. 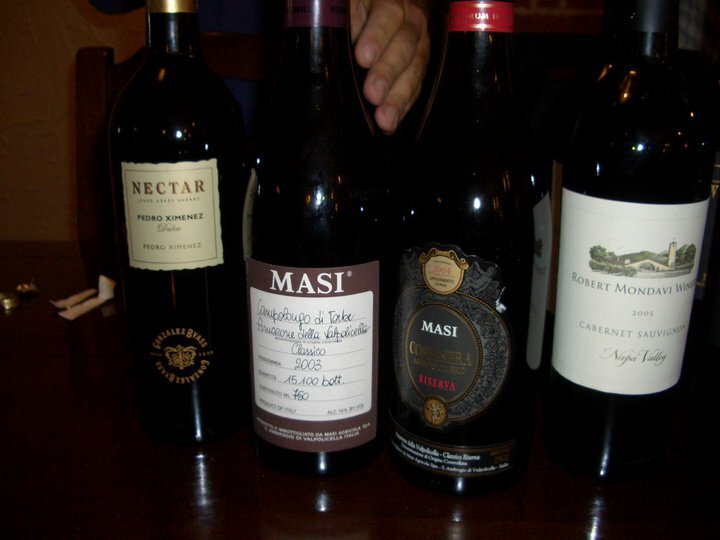 We tasted quickly about 10-12 of their imports and the most interesting, for me, were the 2005 Robert Mondavi Cabernet Sauvignon – a nice big but not bombastic Napa Cab, the 2004 Masi Costasera Riserva – complex with plenty of aromas, the 2003 Black Pepper Shiraz – a surprising Shiraz and the 2003 Masi Campolongo di Torbe – a closed wine that didn’t have enough time to breathe as we were in a rush to catch the returning plane. I find the 2004 Masi Costasera Riserva more approachable and giving more pleasure at the moment than the more expensive 2003 Campolongo di Torbe. Even if the visit was short, it was very well planned and it was a great opportunity for me to taste most of their wines. I am looking forward to do a comparative tasting of their 2006 and 2009. Will post the tasting notes shortly. If you happen to be around Timisoara I strongly advice you to go and pay them a visit as they have a lovely restaurant, good wines and they will warmly welcome you.